SyxxSynse	 03-03-2018 03-08-2018 Failure 5 1/0 Return to Sender/Forward Time Expired. May try other address. Royals1982	 01-05-2018 01-22-2018 Success 17 2/2 signed 2 cards. 1 of them he had his 2 boys sign it too! Great guy! SyxxSynse	 03-20-2017 05-15-2017 Success 56 1/1 Signed my '91 MAXX card. Also had Len and Eddie Wood to sign it! 56 days. 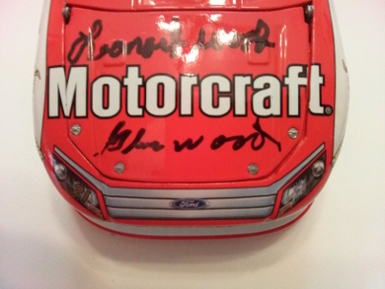 Thanks, Wood Brothers! PnutSmith77	 10-28-2016 11-10-2016 Success 13 1/1 Signed my Legends card. Thanks Mr. Wood!!! dunkanarchy	 08-12-2016 08-27-2016 Success 15 3/3 Signed all 3 cards I sent. Thank you Mr. Wood! dunkanarchy	 06-03-2016 06-23-2016 Success 20 2/4 Signed both cards I sent, and he had his sons Eddie and Len sign the 1991 Maxx card that had all 3 of them on it. Thank you so much Glen, Eddie, and Len Wood! 21ccl	 07-07-2015 07-20-2015 Success 13 1/2 Sent a HOF Inductee card back with my picture that I sent. Thanks Mr.Wood! SyxxSynse	 03-16-2015 03-23-2015 Success 7 1/1 Sent diecast hood. 7 days. Thanks, Mr. Woods! Thunderfoot	 11-12-2013 11-29-2013 Success 17 2/2 Signed 08 and 09 legends, 15 days, thanks glen! Riggs	 06-12-2013 06-27-2013 Success 15 2/2 sweet success, glad to add this to the collection. bcommerce	 04-04-2013 04-22-2013 Success 18 2/2 Sent 2 Cards!! Signed both with HOF Inscription!! bcommerce	 01-07-2013 01-25-2013 Success 18 1/1 Sent 1 Card! Signed but was smeared! justinw182	 04-05-2012 04-14-2012 Success 9 1/1 Recieved my card back and signed in 9 days! Pmurdick25	 07-08-2011 07-25-2011 Success 17 1/1 Great success from a HOFer. Riggs	 06-15-2011 06-27-2011 Success 12 3/3 Great Success from this 2011 NASCAR HOF inductee..
SyxxSynse	 03-07-2018 03-15-2018 Success 8 1/1 Signed my 2016 Panini Certified card. Thanks, Mr. Woods!